With the holidays around the corner and a new level of green consciousness rising among kids, this may be of interest to proponents of natural cultural districts. We know you can build digital buildings and towns with digital lego, but what about the real stuff? 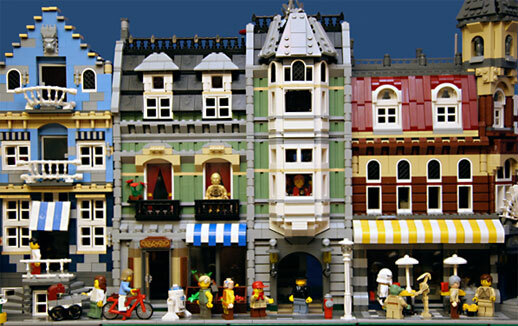 Well, when Lego starts providing pedestrian-oriented buildings, streets and even mass transit sets for kids (and kidults) to purchase, that says we’ve turned a corner as far as what’s cool. Pictured above are the Market Street, Green Grocer and Cafe Corner sets. The Green Grocer (center) features a fully detailed interior grocery, with stairway to the apartment above. How about that, a true live-work unit to aspire to! The Cafe Corner (on the right) is a mixed-use building providing a cafe with outdoor dining on the ground floor, and a hotel on the top two floors, while the Market Street (left) building represents an apartment building that would be worthy of many an urban dweller in the bricks and mortar world. In true customer-driven fashion, these sets were designed via the Lego Factory which allows fans, as mentioned above, to design their own sets. However, in addition to that, these sets were created to allow people to interchange the floors and buildings to build their own cool town! Lego also sells a high speed train set, which can double as in-town light rail, as pictured here.